Is that a GS on the front of the bottle? Royal Purple 10w40. Much happier with it over the oil that was in there by the dealerships. I just used this. Meets all the requirmeets and is relatively inexpensive. I have a 2015 r1200 gs and my next oil change is about 2 weeks away and thought I would try out this "new" oil specifically for boxer engines. anyone tried it yet or know about any results? Why don't you play it safe by using what your manual says: 5W40, JASO MA2??? BMW, as the rest of the world, now specifies lower viscosities. SAE introduced a 16 grade, and will soon introduce a 8 and a 4 grades. I doubt that a liquid cooled boxer needs a 50 grade. I'm assuming that 13W is a typo as it does not exist. Only HD required the use of a grade 60, I wonder what grade is required for the new Milwaukee 4 engine, any idea? I owned a 1996 R1100 RS which I ran in according to the owners manual, and which came factoiry filled with synthetic oil. The RS used oil like water, 600 miles to the quart. I ignored my mechanic who said to run the bike very hard for break in because of the Nikasil liners and the synthetic oil. I paid for that by having to carry oil around with me on trips. This K1200 R I ran hard (no freeway runs) and it uses no oil between oil changes every 6000 miles. I do not know (neither care) about the zinc content, but the newly formulated Rotella T6 5W-40 is now JASO MA-2, good news. Well, I assume you are talking about Rotella T6, 5W40 right? The new T6 meets JASO MA-2, rather than MA for the previous T6. What I understand is that the antiwear level is modified to accomodate the requirements of the new cat converters imbedded in the exhaust systems. (Less zinc stuff). 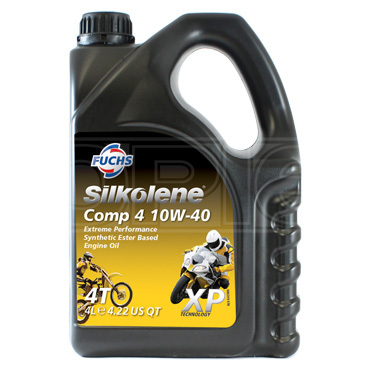 Silkolene Comp 4 syn XP. 10w40. 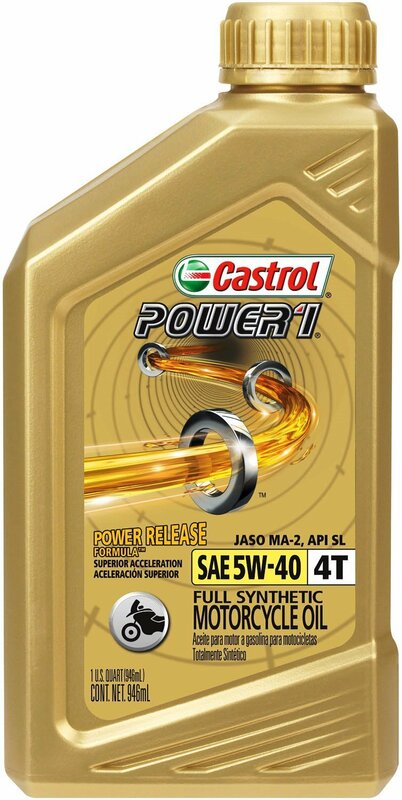 I've been using the BMW-brand synthetic oil for the first 34,000 miles in the K1300S (oil usage < 1/2 quart), but thinking about trying the Castrol Power 1 5W-40 full synthetic, or may try the Liqui-Moly 5W-40 synthetic that BeemerBoneyard includes in their oil change kits. Always a BMW or Mahle-equivalent oil filter. Oil does not contain chunks of zinc, or any other metal for that matter. What matters is not "zinc", but an organometallic compound called Zinc Dialkyl Dithiophosphate (ZDDP). This is an extreme pressure lubricant that is added in varying amounts in engine oils and protects bearings against metal on metal contact under extreme use and also when first starting (when oil pressure is nil). Over the past years, less and less ZDDP is present in car oils. Rotella and similar so-called "Diesel oils" has a higer proportion of ZDDP to protect against the higher pressures encountered in diesel motors. Motorcycles are subject to much higher stresses than car motors, and this is why Rotella (with its higher content of ZDDP) is an ideal oil for use in bikes. Rotella high ZDDP is OK oil, but be sure to remove your catalytic converter if you use a high ZDDP oil. There is much debate on ZDDP, but all reputable sources say ZDDP is only needed in engines that have flat tappet cams or some racing applications. When the debates end and actual testing starts in modern engines; ZDDP adds almost no benefit. Which is why people have great longevity with the API and ILSAC limit on phosphorus at 0.08 percent ZDDP. As far as diesel oils, check the anti-foaming on them. They are made for slow speed engines, maybe it would work in Harleys? I assume we are not talking about racing so I offer this blatant plagiarism. "It's pretty typical for a car engine to have 500cc cylinders (2 liter I4, 3 liter V6, etc). A high revving I4 like you would find in a 600cc sports bike has 150cc cylinders. Even if you shortened the stroke and increased the bore of the car engine the pistons would be much larger and much heavier than the pistons in the bike, so the car engine would still have higher stress for the same rpm. Take that to an extreme like the 250cc I4 in the CBR250RR, and you have cylinders that are only 62.5cc. That means you can have a very short stroke and small, light pistons, so the forces in the engine are very low. That is why those tiny I4's can get up to 20k rpm." A high stress engine lasts around 50K miles, like the new Hellcat. You wouldn't exactly have to remove your CC. It would just deplete the catalytic converter earlier. Removing it would serve no purpose. Don't necessarily disagree with the foaming, but something to consider is that dry sump systems like the ones on the K12/13, have an oil tank whose purpose is to separate the air from the oil. How well that works I do not know. How significant foaming of rotella oil is in this application is a guess. This only matters if you have high oil consumption. If your engine's oil consumption is nil (as mine is), then none of the ZDDP in the oil will get into the cat. For what it's worth, I have used Rotella-T in my 2008 GT since it was new. Checking the cat's operation with my GS-911, shows that the cat still works lke new. If you are using oil between oil changes (consumption), then you can shorten the life of a catalytic converter which is the result of the ZDDP additive contaminating the catalyst. It is for this reason that we do not recommend using Rotella oils in gasoline engines with catalytic converters. There is no way I am aware of to remove the conatmination once it is attached to the catalyst. So no benefit unless you are running an old engine and possible damage to the Catalyst. Use and recommend what you want, but be sure when you recommend a high DZZP oil normally used for diesels you mention the manufacturer's warnings. And our bikes usually use oil. Either this Shell rep is full of it, or this smells a huge legal happening The only way to avoid Rotella to be used in motorcycles or cars gazoline engines, is not to apply any API S or JASO M labeling to the containers. Oh, maybe not. Air Pollution agencies and the EPA are always making sure there is no way to degrade the effectiveness of the pollution control equipment on vehicles. The car manufactures are into the details of making this stuff work too. It gets harder and harder to get that last little bit. So anything that changes things is not good in their eyes. You may have noted the removal of Harley screaming eagle tune products, the change in availability of aftermarket exhaust systems that remove the cat system. An oil that could poison the cat is not good in cars, you can see the zinc based additive has mostly be removed from auto oil. Motorcycle oils have more in it than auto oils but the product in question, Shell Rotella, has quite a bit. It is a great oil along with Chevron 15w40 delo 400. Rotella comes in many forms some have pretty low ZDDP. I run Delo in my 86 Ford diesel truck, great stuff. Max RPM is 2800, just what that oil is made for. Chevron Delo 400 15W40 is their go to diesel oil. (and not a "synthetic") I would not use it in the current new BMW bikes at all. I would not use any oil in my new Beemer that is not Jaso MA2 labelled. But I guess many would use Rotella T6, which is Jaso MA2 approved. I would imagine that most 'diesel' lubes could basically compare one to the other. Why is it that only Shell, to my knowledge, has its diesel oil Jaso MA2 approved??? And to later on have a rep saying: do not use it!!! My bad, Delo 400 in the truck. No way you want this oil in your bike. Oilhead, do you know what the ZDDP replacement is? My friends at Chevron Oil are tight lipped about it for some reason. Shell 'Rotella' 15W40 Diesel...oops wrong forum..I guess this is the Land Lubber forum..
Yea, but my social security is only going up 2.5% next year. I use Royal Purple. The price is good.Bmw oil is far to expencive and as far as I know they don't even make oil so your just buying someone eles oil they sorced out and slaped there name on the jug. You should go by the A.P.I. rating on the jug.SL.SM. are the highest. I looked it up an the A.P.I. site. The higher the last letter the better the oil. BMW is made by Shell. Castrol Power1 is the only oil over here that is officially recommended by BM and if you go into a BM dealer that is all they sell. -5W40 is now the trend. Cars, trucks and even ships are now more often asking for lighter lubes. -Viscosity is important of course but the classification is even more important, in the case of wet clutches like the new GS, RT and now ´´older’´Ks, JASO MA is the key word. A true "Race" oil has a lower detergent level and certainly is not good for 6000m or 10000K. BM’s history with K from when it launched in September 04 has been patchy to say the very least in 10/11/12 BM didn’t change the oil spec because advancing oil tech they did it because they were up too their necks in mud and alligators with mechanical issues so they went from 10/40 to 5/40 the problem then being the camchain tensioner couldn’t handle the thinner oil so BM did the camchain recall. What this board never delves into dealer V self servicing over here in the UK it is still a rarity for folk to service their own K’s outside of official BM system it is done but not by many,hence why most of us know how the system over here works and Castrol is the solus oil sold over here in BM dealers even buying 5/40 Power 1 is a hassle outside of the system have a look on eBay UK to see how little is sold people I know who need it get it sent from Germany. But the reality is we don’t view it as a problem when it comes to solus franchised BM dealers we are spoiled for choice I have 2 within 10 miles and if I was prepared to travel an hour from home could include another 4. I used redline racing oils at the track on my aircooled bike and once on the gsxr750 this year. They specifically say to change oil frequently because of the lack of detergent in the oil. But of the antiwear stuff, it's pretty robust. After the trackday, I switched back to the "cheaper" oils. Motorcycle oil, once you find one you like, you tend to stick with it for no particular reason. Changing to this on my '15 K1300s MS with a K&N oil filter next week. I'll check back in after 1000 miles. The BMW-branded 20W-50 has been in my K12GT for all of it's 50,000 miles....BUT now I'm switching to the LIQUI-MOLY. ....although I'm not anticipating any, I'll report any weird effects.